When walking to and from the festival site, please do so QUIETLY and with due respect to the local inhabitants. Access down Moor Lane is especially narrow and it is advised that you walk in single file and take great care of vehicles. PLEASE do not consider short cuts back to your campsites or trespassing through private property. For Croyde travel around Barnstaple using the “Downstream Bridge” and keep on the A361 taking the left at the traffic lights in Braunton and proceed on the B3226 to Croyde via Saunton. Parking is available and operated by private companies, get there early to avoid disappointment and hassle. For detailed ‘turn by turn’ directions to the Arena in Croyde enter EX33 1NZ as your destination in the AA route finder or on your GPS. Be careful to avoid the village of Georgeham in any options, it is a small village and doesn’t cope well under excessive traffic. 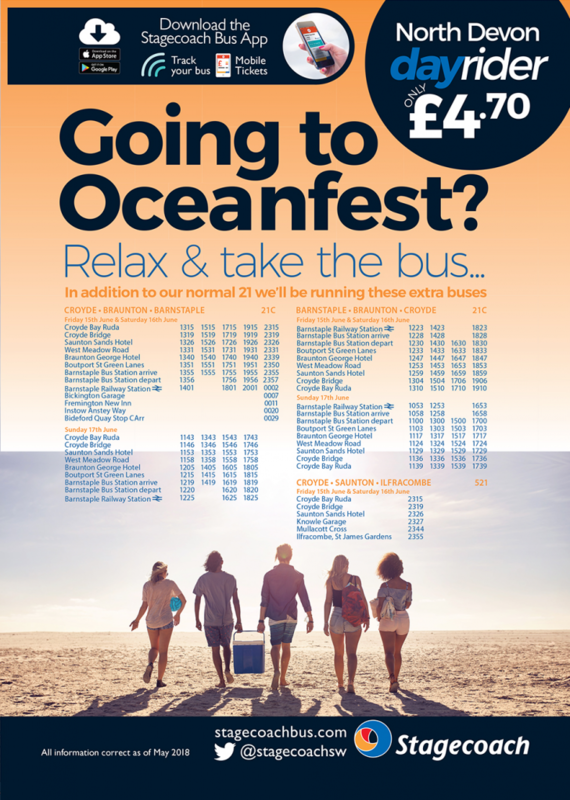 Car share to Oceanfest to save money on your journey and meet other festival-goers. Car sharing is a great way to travel to Oceanfest festival, you’ll make new friends along the way, make money back from your empty car seats and help the environment. Simply find or post a journey to GoCarSharing! National Express operate services between London and Ilfracombe, via Bristol and taking in Taunton and Tiverton. Take a look at www.nationalexpress.com for timetable and prices. Paddington to Penzance service stops at both Tiverton Parkway and Exeter St. Davids. Tiverton is ideal if you have a lift already secured. If not, change at Exeter St. Davids and catch the Tarka Line to Barnstaple. The SouthWest is serviced by airports at Bristol, Exeter and Newquay. Check operators routes and schedules for flights.